Zumsteeg’s version of this ballad was published in 1800 in the second book of the Kleine Balladen und Lieder. Of all earlier composers, apart from Mozart and Beethoven, Schubert’s connection with Zumsteeg’s music is the best documented. Schubert’s schoolfriend Anton Holzapfel recounts how Schubert busied himself with Zumsteeg’s Kleine Balladen und Lieder (seven volumes published between 1791 and 1805, 170 settings in all) and was enthralled with them. 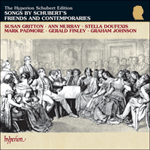 The use of recitative, the explorations of mediant key relations and enharmonic modulations, the attempt to find a musical unity for the setting of an extended text, all these things Schubert took to heart. Like a young painter attempting to copy a famous painting he set out to compose a number of ballads with Zumsteeg’s version opened before him as a model. It goes without saying that his achievements quickly outstripped Zumsteeg’s, not so much in matters of declamation and technique (Schubert often followed the older composer’s choice of key and his time signatures) but in the adventurousness of the piano-writing and the creation of dramatic atmosphere. 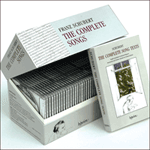 The Schubert songs with a close Zumsteeg connection are Hagars Klage, D5, Lied der Liebe, D109, Nachtgesang, D314, Ritter Toggenburg, D397, Die Erwartung, D159, and Skolie, D507. Zumsteeg’s influence on Schubert was at its strongest between 1811 and the spring of 1816 when Schubert made his second version of Die Erwartung. Der zarte Fuss zum Sitz der Liebe, trägt. O lösche deine Fackel, Tag! Sie flieht des Strahles unbescheid’nen Zeugen! Darf still herblickend ihr Vertrauter sein. Trinkt von der heissen Wange mir die Glut. Von der eig’nen Fülle schwer. Die Kelche schon, die seine Gluten hassen. Die Welt zerschmilzt in ruhig grosse Massen. Und alles Schöne zeigt sich mir entblösst. Seh’ ich nichts Weisses dort schimmern? Glänzt’s nicht wie seid’nes Gewand? Den Schatten nur von ihres Mantels Saum! Did I not hear the gate? Was that not the bolt creaking? you are to receive her in all her radiant beauty! its fair burden to the seat of love. and the immodest witness of the sun’s rays! looking calmy on, may be its confidant. and I see all creatures united in bliss. swelling lusciously, hidden among leaves. drinks the glow from my burning cheeks. something rustling in the leafy walk? heavy with its own ripeness. in sweet death, and its colours fade. which loathe day’s fire, open boldly. the world dissolves in vast, calm shapes. and all beauty is revealed to me. the glistening of a silver garment? against the row of dark yew trees. the arms that desire to embrace them are empty. No joy in shadows can cool this breast. and the hollow dream will come to life! waking her beloved with kisses.